It all started with a play. Many know that 1939 was a spectacular year when it comes to film. Often called the Greatest Year in Film History, this was the year Gone with the Wind, The Wizard of Oz, The Women, Stagecoach, and many more first premiered. But 1939 was also a spectacular year when it comes to theater--this was the year The Philadelphia Story had its debut on Broadway. The play and its lead part of socialite Tracy Lord were written by Phillip Barry specifically for friend Katharine Hepburn, who had recently been branded "Box Office Poison" in Hollywood. Though she had won an Oscar in 1933 for Morning Glory, the Independent Theater Owners of America suddenly decided that Kate (and others that included Greta Garbo, Marlene Dietrich, and Joan Crawford) should no longer be considered popular or profitable due to a series of box office misses. Even films of hers we now consider classic--such as Bringing Up Baby and Holiday (both 1938)--were, at the time, poorly attended by audiences. As a result, a rather dispirited Katharine left Hollywood for the boards of Broadway to play a part so significant it would forever change her. "I gave [Tracy Lord] life," she later recalled, "and she gave me back my career." Katharine was not the only one who appreciated the quality of the play and the opportunities it could offer. In 1936, Howard Hughes--billionaire business magnate, filmmaker, engineer, aviator--was introduced to Kate by mutual friend Cary Grant. The two strong personalities were attracted to one another and dated until 1938; they remained friends even after that. Hughes saw what a great talent she was. He also saw the struggles she was experiencing in spite of that talent. 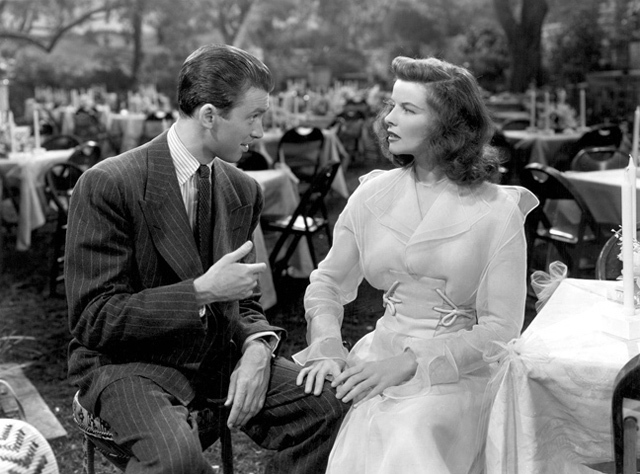 So, when The Philadelphia Story was written, he almost immediately bought the screen rights to it and handed them over to Katharine. It was perhaps the greatest gift she would ever receive. And so, after more than 400 performances of the play, she took those rights and ran...straight to the studios of Hollywood. Though she had been with RKO in the 1930s, she decided on MGM as it had always been considered the very best and boasted "more stars than there are in heaven." In addition, MGM head Louis B. Mayer agreed to an offer she couldn't refuse--essentially, she had her pick of cast and crew. Choice of director? George Cukor, her friend who already directed her in Bill of Divorcement (1932, her first film ever), Little Women (1933), and Holiday (1938). Choice of screenwriter? 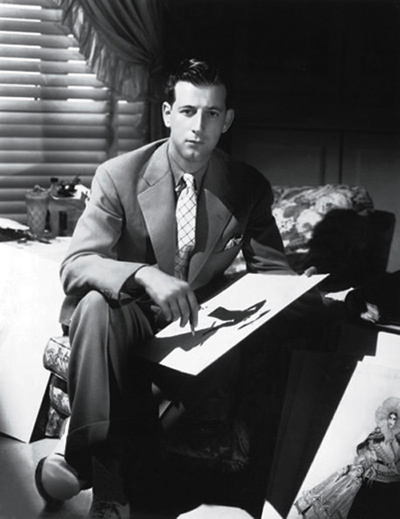 Donald Ogden Stewart, a renowned dramatist and member of the Algonquin Round Table who had just adapted Holiday for Cukor from another play by Barry. Choice of co-stars? Cary Grant and Jimmy Stewart (ok, so she chose Clark Gable and Spencer Tracy first, but they were busy). Both Donald Ogden Stewart and Jimmy Stewart--completely unrelated--would walk away with the film's two Oscars. It was nominated for four more, including one for Best Actress. Without a doubt, Katharine had her choice of costume designer as well. Adrian, MGM's head costume designer, was a legend in the industry and had strong relationships with his stars since the late 1920s. He helped establish their style offscreen as much as on. Two of his leading ladies, in particular--Greta Garbo and Joan Crawford--were shaped by Adrian from nearly the beginning of their careers. Jean Harlow is another, who found a certain refinement with him at MGM after years (looking like a "floozy," said Mayer) at Warner Brothers. All three defined much of the look of the 1930s with their signature styles--again, courtesy of Adrian--and have become huge influences in fashion today. Though Katharine Hepburn is another who is strongly associated with Adrian, theirs is a very different relationship. In contrast to Greta, Joan, and Jean, Adrian came into Kate's life relatively late--1940's The Philadelphia Story is their first work together and a moment she had eagerly anticipated. "Adrian was my favorite designer," she said. "He and I had the same sense of 'smell' about what clothes should do and what they should say." 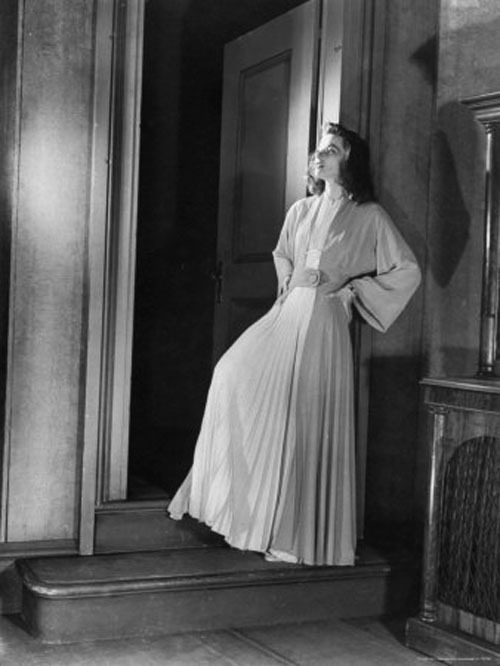 Another of her favorite designers, Valentina, had created the costumes for the stage version of The Philadelphia Story, but Katharine deeply admired Adrian and trusted him to offer a continuity to those costumes. 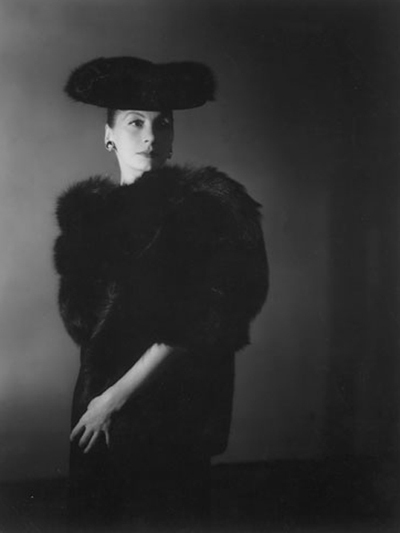 She also knew he would create his own spectacular designs and that they would reflect her personal style. 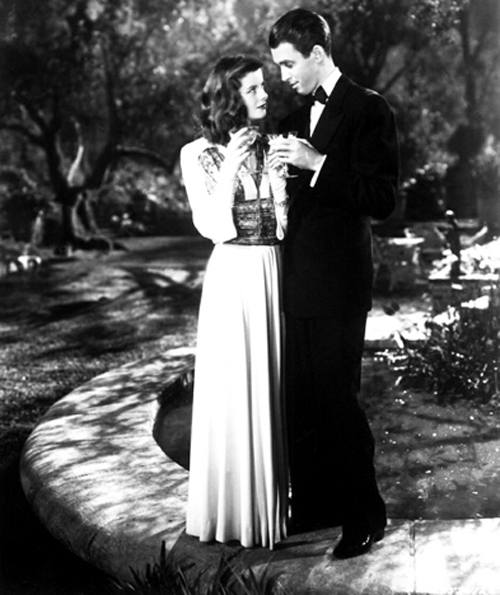 It is not too much of an overstatement to say that The Philadelphia Story is revolutionary in its costume design. 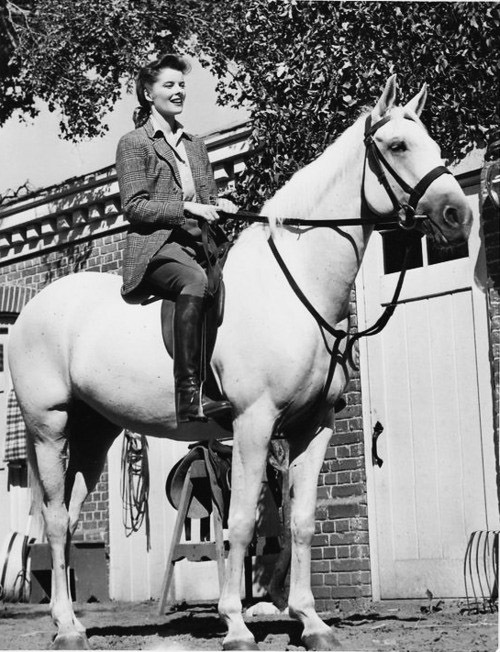 It features not one, but two examples of menswear...three, if you include her equestrian ensemble as well. All of these outfits essentially open the movie, too, which was unprecedented. It's hard to remember that this was a time when women weren't really wearing pants; even with icons like Garbo and Dietrich blazing the way in the 1930s, it was not often seen onscreen. Kate's desire to wear pants, particularly in the opening scene of this film, was objected to by both producer Joseph Mankiewicz and Louis B. Mayer. But her arrangement with MGM allowed a tremendous amount of control, and she literally showed them who wore the pants in their relationship. Adrian's gowns for her are also iconic, especially the Grecian 'goddess' gown Tracy wears to the party on the eve of her wedding. It is a perfect combination of soft and strong--almost an armour for the character to wear while she does battle with the men in her life as well as her own emotions. That gown and the one for the wedding itself would immediately impact fashion in the 1940s and both continue to influence designers today, such as Versace and Zuhair Murad. Yet another of Adrian's costumes includes a gown-like robe that would go on to inspire John Mollo's Oscar-winning costume design for Star Wars (1977). All this said, tragically, the costumes for The Philadelphia Story were ineligible for their own Oscar...the Academy would not designate an award for costume design until 1948. 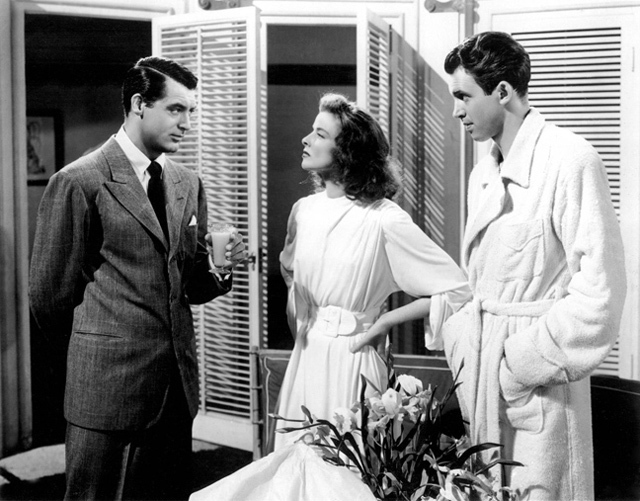 Though it didn't win an Oscar, it sure won when it came to a lasting legacy in both costume design and fashion--check out this article's Cinema Connection for many examples of the influence of Adrian and The Philadelphia Story today. 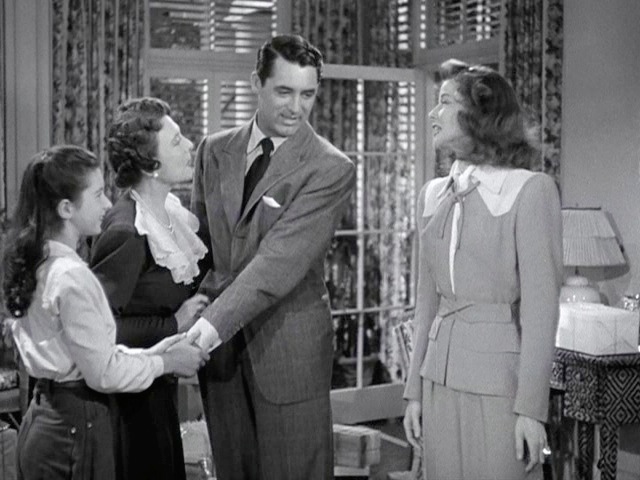 Knowing I was about to share one of Adrian's best wardrobes on film, I invited friend and fellow costume design historian Christian Esquevin to discuss the The Philadelphia Story with us. He authored the definitive book on the costume designer called Adrian: From Silver Screen to Custom Label and also writes for his own site Silver Screen Modes. And so, on the eve of his exhibition at the Museum for the Fashion Institute of Design & Merchandising (FIDM) called Designing Hollywood: Sketches from the Collection of Christian Esquevin (opening June 10th), I sat down with him to talk about his favorite subject. 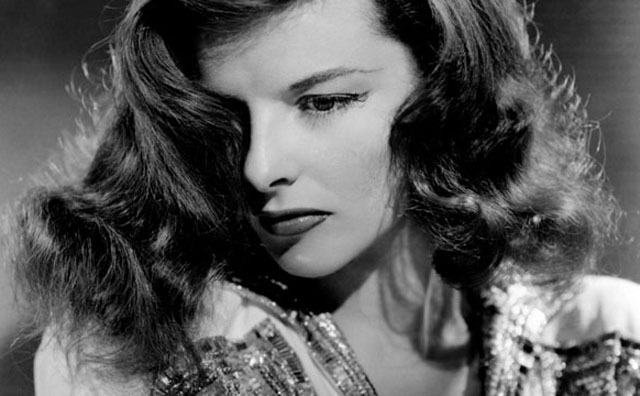 Let's start by talking about Katharine Hepburn at MGM. How did Adrian approach working with her and her wardrobe that may have been unique (versus Greta Garbo and Joan Crawford, for example)? Each movie's costuming is the same in that you have to help define the character and the role through the actor’s dress. Yet each actor is a different personality with different looks. And with the leading ladies, they had strong opinions about what they wanted and how they should look. This was a balancing act for the designer. It helped to have Adrian’s skills and reputation to convince most all the actors. With Crawford and Garbo, he had worked with them from almost the very beginning of their careers and had virtually created their looks. Kate came relatively late to MGM, but she came impressed by his reputation. She was at a low point in her career, but he recognized her amazing talent. She also had the kind of figure he loved to work with--relatively tall, broad-shouldered, slim-hipped, and athletic. They were both looking forward to working together. 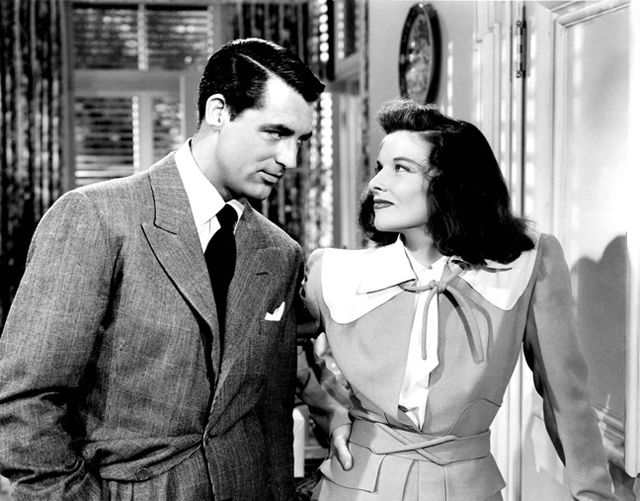 The Philadelphia Story was their first chance to do so, and unfortunately their first of only three films since Adrian left a couple of years later to start his own business [for his fashion line Adrian]. 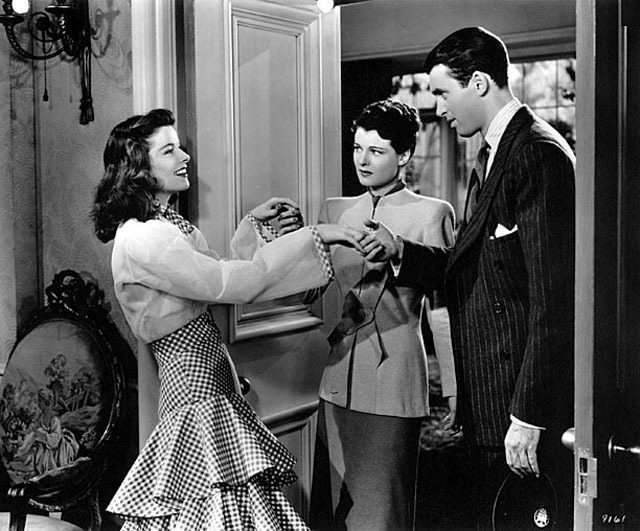 Katharine did The Philadelphia Story on Broadway before it became a film, with costume design by her friend (and fashion designer) Valentina. Was there a discussion between Kate and Adrian about the strategy of the movie costumes? How were they similar or different from the play? The costume origins for the movie of The Philadelphia Story were quite different than for Adrian’s other films. As you say, it had been a play and Katharine had acted the part on Broadway for a year. She also owned the rights to make it into a film. So she was already known for her role and comfortable in her costumes that Valentina had designed for her. While I can’t be completely certain, I personally have no doubt that she discussed her costumes for the film in terms that they should stay in the spirit of those she had in the play. 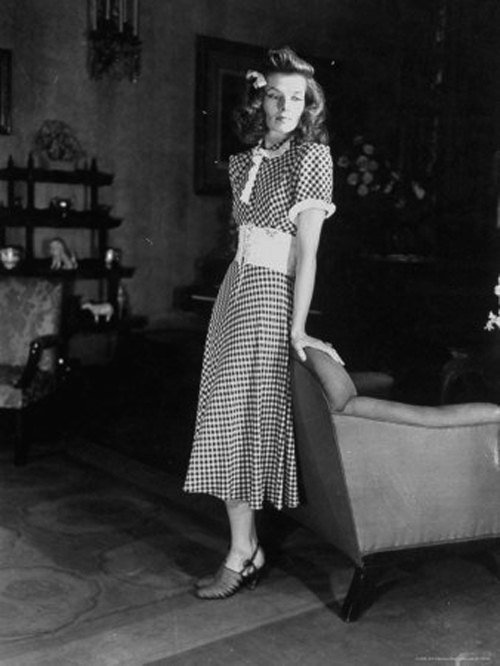 As an example, Tracy had a gingham dress in The Philadelphia Story play, and Adrian would use a gingham dress in the costumes he designed for the movie--only his would be different. In any case, Adrian’s job as a costume designer was to define character, and we can see that in addition to creating amazing gowns and dresses for Katharine. 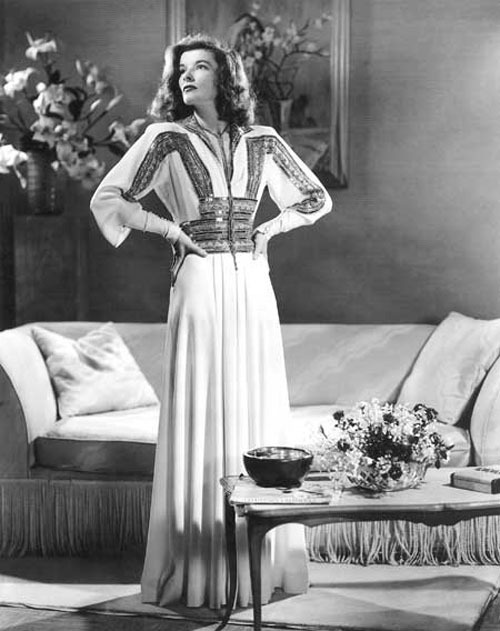 Valentina was another favorite designer of Kate's and was known for her corset cross-hatch detail at the waist, which appears in film costumes for The Philadelphia Story. Is this an example of continuity from stage to screen, simply a design coincidence, or was Valentina herself involved in some way (as she reportedly was on The Desk Set)? 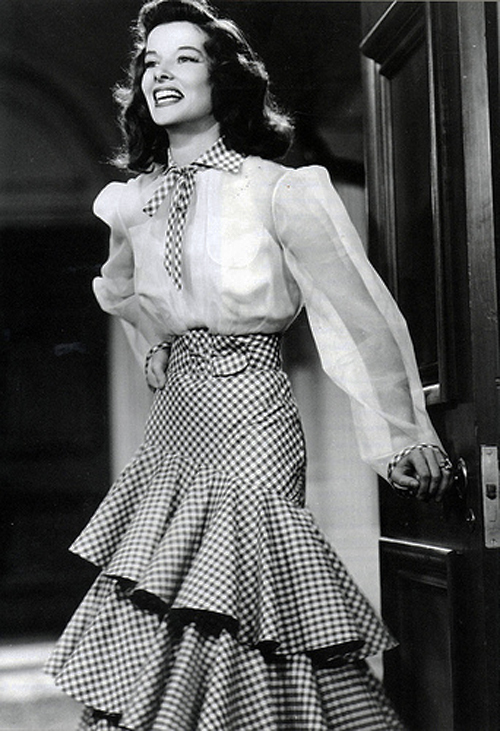 Valentina used a corset over her gingham costume for Katharine [in the play version of The Philadelphia Story]. I think Adrian used some of this as part of the theme of continuity that Katharine wanted to maintain, [though] he was also a fan of decorating with self-belts, buttons, straps, flaps, and other techniques. Valentina herself was not involved in the movie. Adrian would never permit, with only one exception that I know of, another designer to be involved in any of his movies. What color was the gingham tiered dress? This dress was made of red and white gingham. I think the two gingham dresses [from the play and film] make for an interesting comparison. Both only appear in black and white images. Since we're comparing costumes from the play and the film, let's continue that conversation and talk about two others--the iconic Grecian 'goddess' gown and the near equally famous wedding gown. Valentina had designed very similar gowns for the play, which may lead some people to say that Adrian copied Valentina. Adrian generally abhorred copying others, and he certainly never needed inspiration from anybody else. But here he was led to use these general themes. If I may say so, he went beyond designing a beautiful Grecian 'goddess' and wedding gowns, as had Valentina, to designing costumes that were both beautiful and sublime. Adrian’s Grecian gown conveyed feminine power--those beads and sequins and that strong shoulder protected her from any male incursion, and the symbolism of her mid-section wrapped in metallic sheathing was clear. As you say in your book Adrian, it almost wouldn't seem wrong to also see her standing there with a sword and shield. She seems quite ready to do battle. And what are your thoughts on the wedding gown? At the end of the movie, she’s in her wedding gown, similar to Valentina’s. But his gown has that strong shoulder, only now it’s made of a wispy mousseline de soie with shoulders in a separate piece that flapped in the breeze. Here is a total contrast in costume that tells the whole story of character development. That's what made him such a great costume designer--his clothes were for the character and the story. The gowns just also happened to become so influential in fashion. Two of Adrian's stars--Katharine and Greta--were well known for their style, particularly when it comes to pants. What was Adrian's opinion of that look? 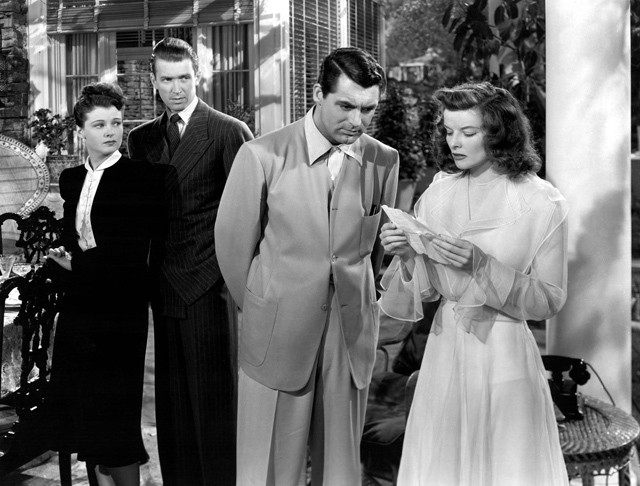 Did Kate specifically request a pants ensemble for The Philadelphia Story? Yes, pants were popular with several stars, especially with Kate. 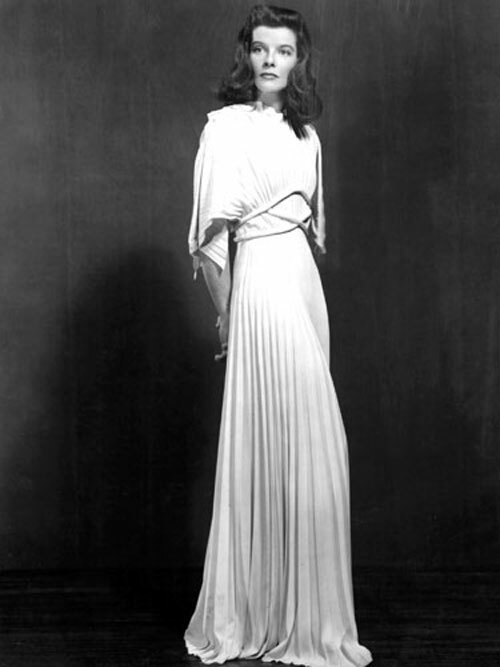 Adrian had designed several pants or pajama outfits for Garbo starting in the late 1920s. And of course Marlene wore them on film [designed by Travis Banton], mainly to shock, since she always liked to show off her legs. Adrian personally liked pants, as long as the style was not over-done. I think Kate did ask him to design them for her in the film, knowing his sympathy for them. They were not in the play as far as I can tell. There were actually two pants outfits Kate wore in the film. This prompted the producer to ask Kate if she was sure she wanted to wear pants twice. And she got away with a third pants look by her equestrian ensemble, too. 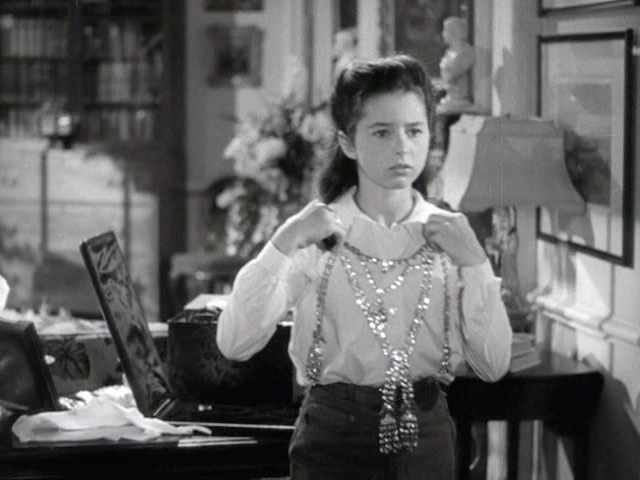 especially when she says that this necklace--previously used for Marie Antoinette (1938)--simply "stinks"
Finally, Adrian has an enormous legacy in both costume design and fashion. Though Kate had her own sense of style, clearly Adrian made his own contributions to it. What do you consider his greatest contributions to her style that you would like everyone to better appreciate? 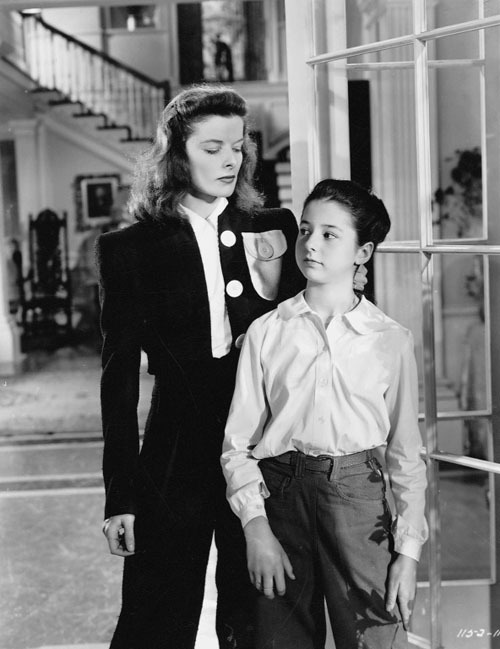 Adrian understood Katherine Hepburn and the kind of character she wanted to convey on the screen. He designed costumes for her that had clarity and strength. At this stage in her career, she only played roles that suited her. Adrian had the facility to design for both ends of a polarity, which was perfect for Hepburn. His costumes and fashions for her could incorporate all her angularities and strong features while still being feminine and enticing. Adrian had that ability to design the perfect costume for her that captured the role and that fit Hepburn’s personality. It’s amazing that he was able to do that for so many other stars as well. And they were beautiful! be sure to check out all the other great articles included in the event! 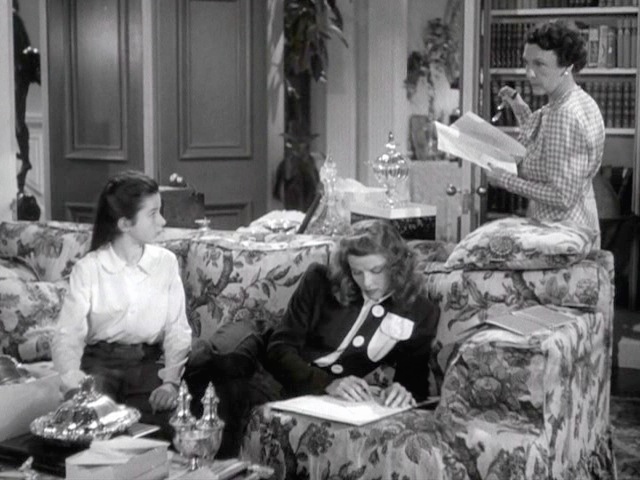 What a great discussion of Katharine Hepburn's wardrobe for "The Philadelphia Story"! Adrian and Hepburn were a match made in costume heaven. It's especially fascinating to see the costumes for the play in comparison to the costumes in the movie. Thanks, Kimberly and Christian! 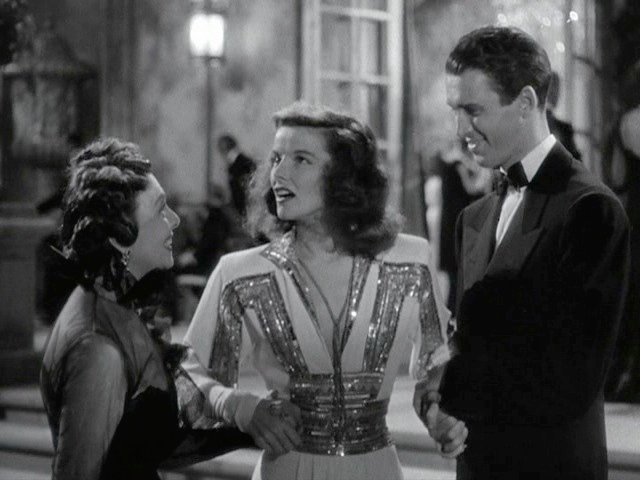 Kimberly, Christian, I really enjoyed your fascinating post about the costumes in both the Broadway versions and film versions of The Philadelphia Story. It was interesting to see the backstory of how the film evolved from so-called "Box Office Poison" to (multi) Oscar winner! Great post! Thanks Margaret! 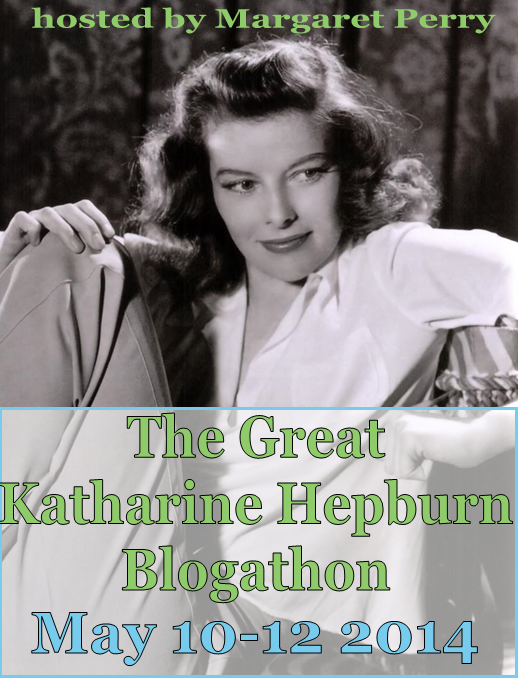 Glad to be a part of your great blogathon celebrating Katharine Hepburn. 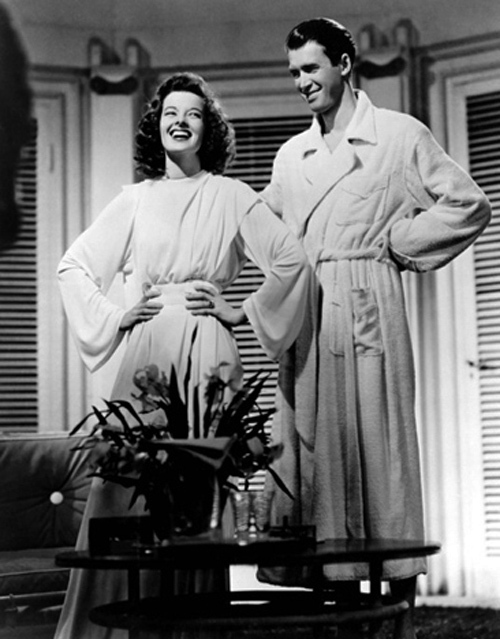 How wonderful that you got to see the actual 'goddess' gown from PHILADELPHIA STORY--I'm so jealous! That exhibition is in Phoenix now, so I'm been hearing raves from friends who saw it in London and those who are seeing it now in Arizona. Cheers! Thanks Dorian! 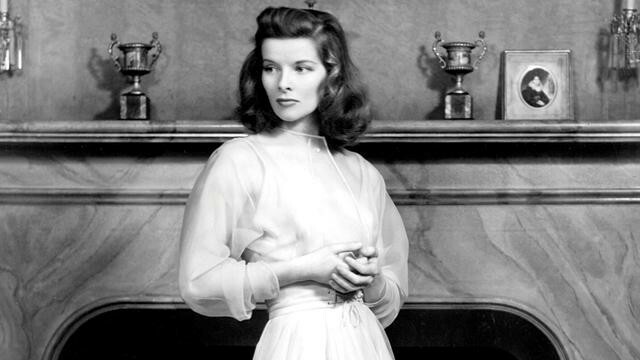 Yes, it is fascinating to look back at someone as revered as Katharine Hepburn and see that even she went through challenging times in her life. Granted, she had a supportive family and a billionaire boyfriend, but I still admire the gumption she had to take on such a difficult situation in her career. Quite the triumph and a lesson to us all to believe in ourselves and never give up! I'm glad you included costumes from the stage play – it was interesting to see the differences between the play and the film. As much as I like the stage wardrobe, it really pales when you compare it to the fab Adrian's work. Thanks to your post, I watch for "personality development" clues in a character's wardrobe. Last weekend, we were watching "The Best Exotic Marigold Hotel" and we noticed Judi Dench's wardrobe changed as she became more integrated in her new environment. See? I'm learning lots from you. Thanks Ruth! I am so proud of you--you really are noticing one of the most important aspects of costume design, which is character development. I love that it's one of the things you picked up here! Glad you enjoyed the comparison with the stage play--I think Adrian's costumes surpass Valentina's as well! In fairness to Valentina, her costumes made something of a splash in fashion and people were a-buzz with them. But of course it was nothing compared with those from Adrian. Even with the fact that he went for a certain degree of continuity, he made a huge splash then with his costumes and they have continued to influence design today. Really remarkable. Wonderful post, and a great interview with Christian. I didn't realise that KH had to fight so hard to wear trousers in this, she wears them so well and so naturally, today it's hard to imagine the scandal that was associated with them. Good to see that Kate pushed her point. I also saw the costumes in London, and they were even more wonderful up close. 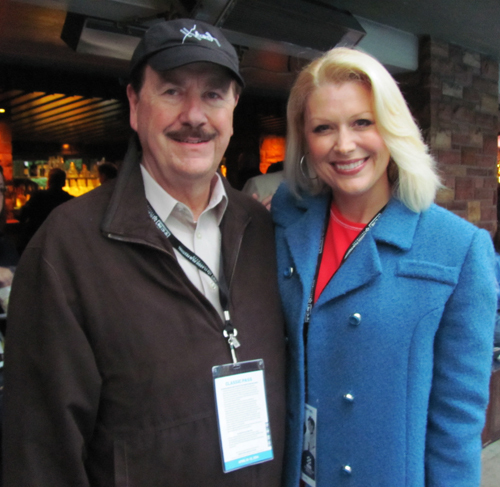 Thanks Kimberly for the opportunity we had to talk about Adrian and Katharine and this wonderful movie. It was nice of you to feature it on your blog. As we've had a chance to see this and other Kate films on the occasion of her birthday, it's amazing how many of them are so much fun to watch over and over. 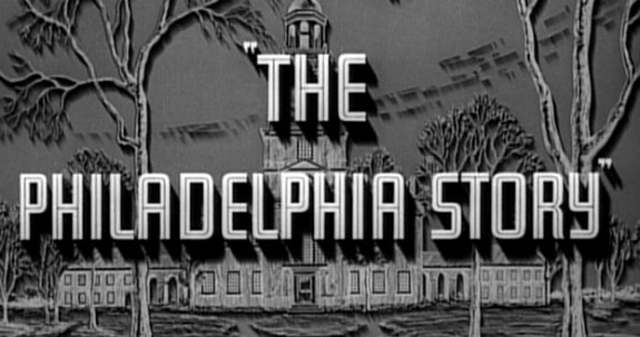 Philadelphia Story I've seen dozens of times and I never tire of it. Analyzing the costumes is fun for me too, when done on a separate track. Thanks again Kimberly and keep up the great work! Thanks Christian! It's always a pleasure to spend time with you and talk, especially when it's about our mutual love of great costume design. 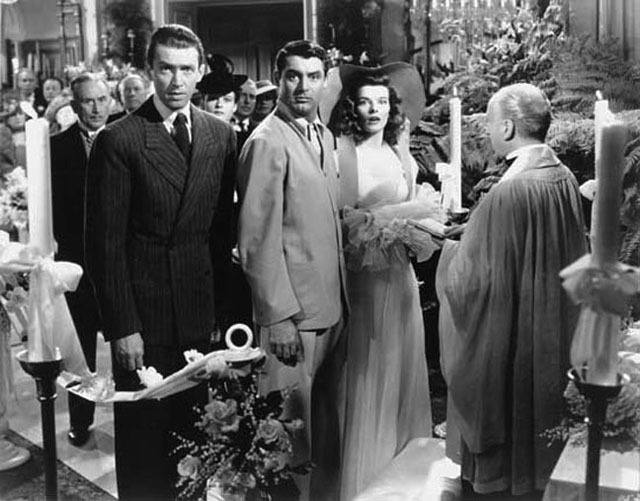 I feel the same way about THE PHILADELPHIA STORY--it put a spell on me decades ago when I first saw it, and I never tire of watching it either. And what never ceases to amaze me is the fact that we continue to observe and learn new things about these films we love, again especially when it comes to costume design. The journey never ends.